Now you can create your own personalized compact filled with four (4) great products for your eyes, your lips and your face! You already know how much I love the e.l.f. products (the mascara & eyeshadows especially), so I couldn’t resist sharing the fact that they have a new cool product called e.l.f. elements. It’s a compact consisting of 4 different e.l.f. products in one. YOU get to choose which 4 products you want inside! It doesn’t get much cooler than that. e.l.f. 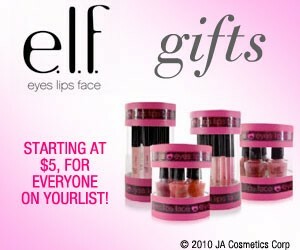 products are always just $1, and it’s no different with the e.l.f. elements compact. Each product/shade you choose costs just a buck. Trust me when I say, ladies love this stuff! e.l.f. is truly the best thing to hit the fashion counter in a decade. And, it’s definitely the most affordable quality cosmetic on the market today! Check out the e.l.f. interactive site online where you can mix & match your colors and types of products for your e.l.f. elements compact. When was the last time you had this much fun picking out makeup?? ?